From left to right: moderator Dr. David A. Shirk and panelists, Amb. Jeffrey Davidow, Dr. Victor Espinoza, Dr. Clare Seelke, and Dr. Emily Edmonds-Poli. 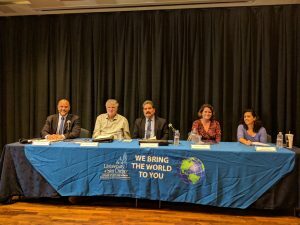 10/03/2018 (written by Rita Kuckertz) – On Thursday, September 20, 2018 Justice in Mexico, in collaboration with the University of San Diego’s Master of Arts in International Relations (MAIR) program, hosted a panel of experts in order to discuss the significance of Mexico’s 2018 Presidential Election and what to expect from the incoming administration. Panelists included Clare Seelke of the Congressional Research Service; Dr. Victor Espinoza, Director of the Department of Public Administration at the Northern Border College (El Colegio de la Frontera Norte, COLEF); Amb. Jeffrey Davidow, former U.S. Ambassador to Mexico; and Dr. Emily Edmonds-Poli, faculty member in the Department of Political Science and International Relations at the University of San Diego (USD). Dr. David A. Shirk, Director of Justice in Mexico and the Master of Arts in International Relations program, moderated the panel discussion. Each guest speaker shared their expertise on the topic of Mexican politics in order to reflect on the nature and outcomes of Mexico’s July 1st vote. Given the exceptional nature of these elections, Dr. Shirk asked the panel of experts to especially consider the historic upset of traditional party alignments, the future of the U.S.-Mexico relationship, and the observed increase in political violence leading up to July, 2018. Clare Seelke explained the triumph of Morena party candidate Andrés Manuel López Obrador as the result of the public’s desire for radical political change. Seelke posited that other candidates running for the Mexican presidency, including Ricardo Anaya and José Antonio Meade, were essentially the same in the public eye. According to Seelke, the simple fact of López Obrador’s singularity amidst other traditional candidates may explain the “magnitude of the victory” at approximately 53% of the total vote. Reflecting on the implications of this outcome, Seelke questioned the future of U.S.-Mexico relations in the context of the shared drug and security crisis, the North American Free Trade Agreement (NAFTA), and Mexico’s energy reform enacted during President Enrique Peña Nieto’s tenure. While Mexico has collaborated with the United States on each of these dimensions under Peña Nieto’s term from 2012 to 2018, Seelke expressed uncertainty regarding future bilateral cooperation on these matters. Dr. Victor Espinoza from COLEF spoke at length about the significance of votes from abroad during the 2018 election. He explained that since 2006, there have been a total of twenty-six presidential, senatorial, gubernatorial, and local elections that allowed voters to participate from abroad. However, increasingly, the percentage of eligible voters living outside of Mexico has declined since 2006. In the July elections, Dr. Espinoza noted that this figure was “infinitesimal,” at less than 1% turnout. With 97% of eligible abroad voters living in the United States, this raises questions about the specific factors that have so drastically reduced the participation of eligible Mexican voters there. However, as Dr. Espinoza explained, other trends characterizing the abroad vote in previous elections were reversed; while Mexican voters living outside the country typically opt for conservative candidates, in 2018, the vote leaned left with Morena’s López Obrador. Radical Change or Return to Ruling Party Politics? While a historic election, Former Ambassador to Mexico Jeffrey Davidow argued that, in general, we tend to overanalyze the election of politicians. According to Amb. Davidow, López Obrador won the election because the vast majority of Mexicans who registered to vote were disillusioned with traditional political parties. Concerned about high levels of corruption and what they perceived to be a “rigged” system, the Mexican public opted for a new approach to politics. As such, Amb. Davidow argued that voters did not necessarily stand behind all of López Obrador’s policies; they simply wanted to prevent traditional party candidates from entering office. Dr. Emily Edmonds-Poli, adding to Amb. Davidow’s analysis, reminded those in attendance that López Obrador was once a “staunch priista,” and much of his political behavior today is similar to that of thirty years ago. However, despite López Obrador’s steadfastness, Dr. Edmonds-Poli argued that his election was unprecedented in Mexico’s democratic era. As she explained, historically, those observing Mexican politics have argued that no candidate would ever win with a majority in the multi-party system, especially with a majority in Congress. Thus, the July 1 election was unprecedented in and of itself. Given his election by majority, Dr. Edmonds-Poli contended that López Obrador does indeed have a mandate. However, what remains to be seen is whether the future president will be able to successfully fulfill this mandate. According to Dr. Edmonds-Poli, the stakes are certainly high; with the “groundswell of excitement” that accompanied the rise of Morena, López Obrador supporters (i.e., the majority of those who participated in the July 1 elections) are expectant of change. Should the future president remain in his 1970s political mold, this could severely damage not only his base of support and future legacy, but also, Mexico’s democracy itself. As Dr. Edmonds-Poli reminded viewers, recent public opinion polls found that only 49% of people expressed faith in democracy in Mexico. As such, given this fragile perception, any failure by the incoming government to fulfill its imperatives could inflict significant wounds on Mexican democracy. As with all matters discussed throughout the course of the panel, analysts will have to wait until December 1 to reevaluate Mexico’s course moving forward. To learn about future events, click here.